Panic prevailed in the heart of Milan a few meters from the majestic Duomo cathedral, a symbol of the Italian capital of fashion when something very weird happened! The pavement on the street Mercado began to show cracks. Around eight AM a deafening noise coming from the bowels of the earth terrified bystanders which made them panic and run right and left. 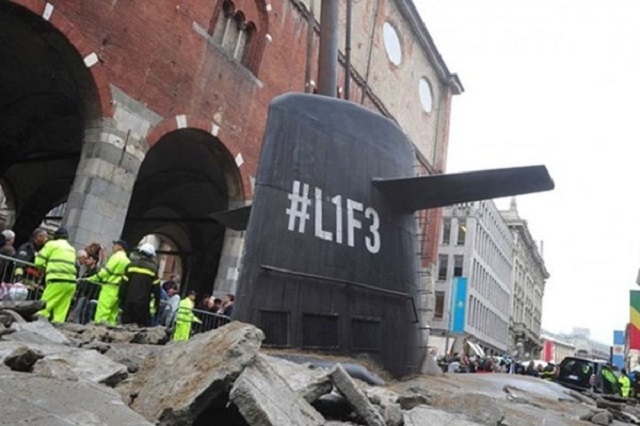 The floor was torn in two and the top of a submarine with the inscription #L1F3 appeared dragging parked cars. From the submarine it was revealed that after some error handling it resulted in ending up in street Mercado where disoriented staff came while the passers by looked upon the spectacle frozen. Within minutes the fire brigade vehicles arrived along with the Italian police, ambulances, all while smoke and dust covered the accident. 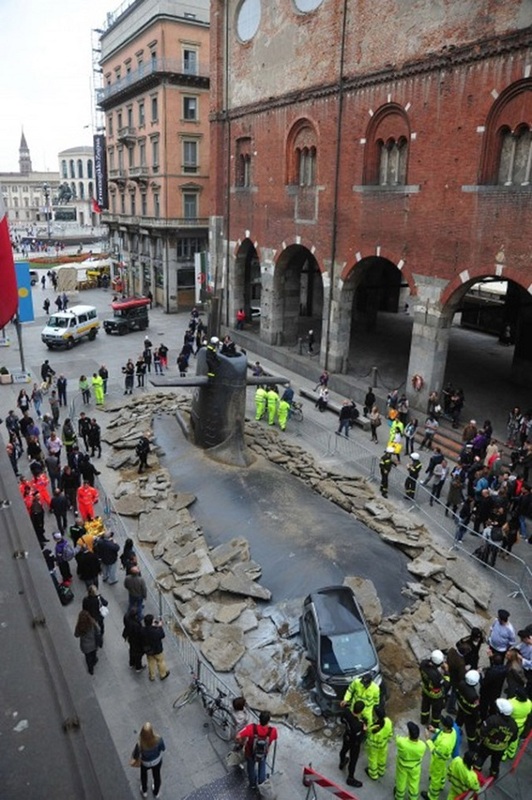 In a statement, the submarine commander said he did not know exactly what happened but all you can be sure of is that the cars affected are fully covered by the insurance company designed with every detail of the above excellent advertising campaign. The scenes that unfolded have nothing to envy from a well made with decent budget movie proving that advertising companies despite the crisis can create diamonds. 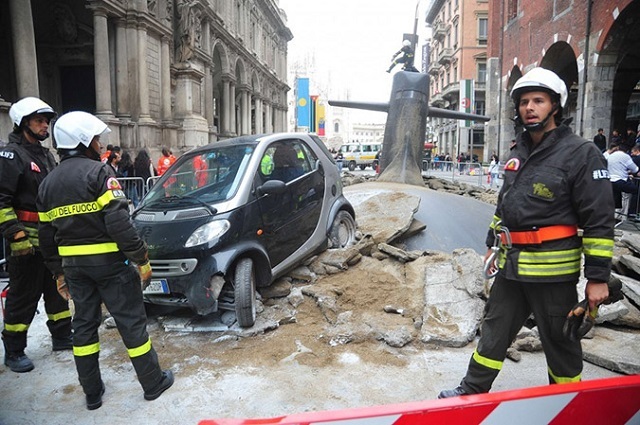 So the submarine that took a wrong turn is nothing more than the promotion of the company Genertel e Europ Assistance which launches its first Life Park Protection Store in Italy which relates to life insurance. The extraordinary effort they put into this could not be sold out so circling the Internet is the imaginative campaign and videos with the statements of the alleged pilot but the video scenes of panic travel to all social networking sites. 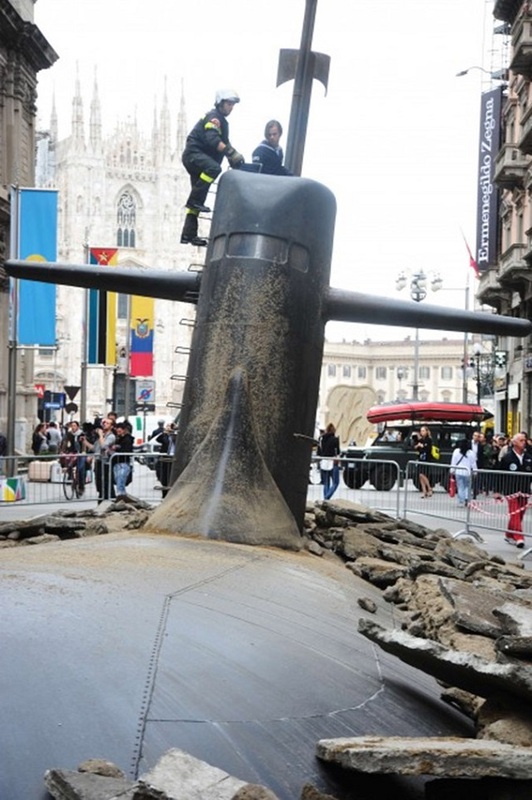 However, the team behind the impressive campaign revealed that the idea of the submarine was born because of the special hydrographic profile of the city of Milan with canals, rivers and streams creating a real water distribution network which permeates the entire city. What other weird surprises can we expect from these insurance companies?